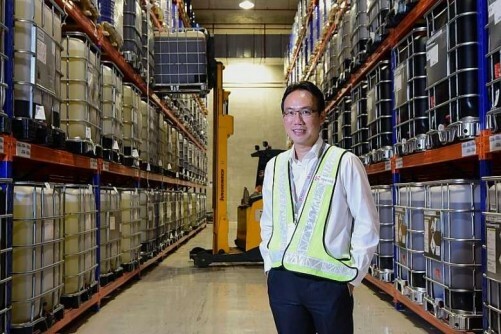 At logistics firm Yang Kee, it is clear that the firm is facing mixed fortunes. While oil rig pipes lie idle, forklifts with chemical drums rove about the loading bay of its chemicals warehouses - where specialty chemicals make up 85 per cent of stored items - an indication of the disparate fortunes facing these sectors. The volume of goods Yang Kee trucked for the oil and gas sector last year crashed by 30 per cent to 40 per cent compared with 2014, general manager for contract logistics and transport Ong Swee Keong told The Straits Times. In the manufacturing, retail and industrial sectors, volumes of goods the firm moved by truck for some customers are "easily down by 20 per cent", he said. Lower capital spending and maintenance needs from the oil and gas sector brought on a slowdown in other areas of the economy, causing a dip in logistics demand, he said. Costs and operating expenses have, at the same time, risen in the tight labour market with the cost of maintaining machines on the rise. "It is very tough at the moment; there is cost pressure and labour supply issues and the market demand is low," he said, adding that 2016 is expected to be "a very tough and challenging year". In spite of the difficult conditions last year, sales for the firm's transport business grew by about 5 per cent last year because of its efforts to acquire new customers. "If we had maintained (things) and did nothing, the drop in Yang Kee's sales would have been in the 10 per cent to 20 per cent range," Mr Ong said. Battered by a fall in trade, the trade-sensitive logistics and transport sector has been hurt by falling demand. Just ask Topsteel Solutions Asia, which distributes pipes and equipment to the oil and gas companies in the region. Its director Gabriel Lim said it spent 30 per cent less on transport services last year compared to the year before. 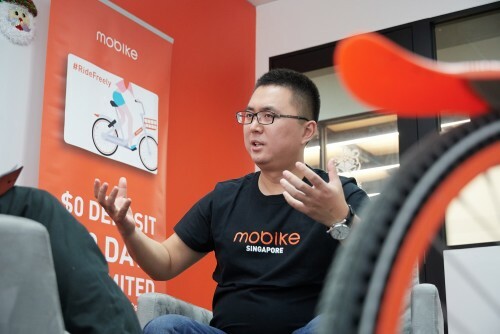 "Generally, the economy for the neighbouring countries, whether Malaysia, Thailand or Indonesia, is down, so that means their demand for our products is less," he said, adding that the company just spends less on transportation and logistics. The growing fears over a global slowdown is casting a pall on the once-vibrant logistics sector. Many firms are struggling to deal with the fall in business, cutting workers and downsizing their operations. The Singapore Logistics Association (SLA) said the slowdown in trade and the manufacturing sector is being "keenly felt, especially amongst small and medium-sized (logistics) enterprises". Most companies face high operating and manpower costs in addition to the slowdown, it said. Some firms have trimmed staff, especially foreign workers, and returned leased equipment. At least one has diverted back-end documentation work to its China office, with much lower labour costs, added SLA. A similar dismal picture emerges in the shipping industry. Plagued by oversupply and falling freight rates for years, shipping companies say there is still no light at the end of the tunnel. Firms in the container and dry bulk segments are having "the most difficult time", Mr Esben Poulsson, president at the Singapore Shipping Association (SSA) told The Straits Times. The offshore marine segment is also struggling very badly, he added. Container shipping demand has also been dampened by outsourcing of production processes and is not growing as strongly as before, said SSA councillor and international committee chairman Rene Pedersen. The dry bulk segment is at an "unprecedented low", said Mr Tan Chin Hee, vice-president and honorary treasurer at SSA. The Baltic Dry Index, a proxy for global freight prices for raw commodities, is at levels close to record lows since 1986, according to Bloomberg data. "There will be a lot of impairments of assets (in the dry bulk segment); ship owners with fleet will find that the banks will be asking them to reschedule their loans... or even sell collateral," he said. It will take awhile to work through the oversupply of ships in the sector because of the massive influx of ships that were built following the 2008 financial crisis, said analysts. Back then, firms purchased newer and larger ships as many aimed to take advantage of the falling ship prices and cheap bank financing, said Mr Tobias Pinker, chief financial officer of shipowner and manager Schulte Group. "Fortunately, we have a fleet that is to a great extent still employed on a long-term basis, but of course, the longer it takes for the market to recover, the more our ships will have to search for new employment", he said. Still, the situation has become so dire that leasing rates for ships barely cover operating expenses, said Mr Pinker. "It's very close and in the end, a few hundred dollars will make the difference." These problems have, in turn, spilled over to the ports here, with many port workers nervously watching the shores. Workers at the port at Tanjong Pagar told The Straits Times that fewer ships are now seen and that machine utilisation has also fallen . Container throughput fell 8.7 per cent last year, and cargo throughput dropped 1.1 per cent, a sign of the trying times. For now, Jurong Port told The Straits Times it does not anticipate any need to downsize its workforce in the near term. However, it expects cargo volumes to decline modestly this year from last year. But it is not all gloom and doom. Pockets of growth still remain in the overall trade sector. One of them is e-commerce, which has been boosted by the changing shopping habits of consumers here and elsewhere. A report by consultancy AT Kearney estimated that the e-commerce market is likely to explode in growth over the next few years, doubling from US$839 billion (S$1.2 trillion) in 2014 to US$1.5 trillion by 2018. Logistics firms here are sensing the opportunities and are switching up their business lines to cater to increased demand. SingPost, for instance, has invested heavily in building an e-commerce business and setting up a regional logistics network to enable the seamless delivery of parcels. Others like Yang Kee sees opportunities in the areas of specialty chemicals, healthcare and food and beverage. It started developing capabilities to store specialty chemicals in 2012 because it noticed there were plans for more of such materials to be manufactured on Jurong Island. Sales to this sector grew around 50 per cent last year off a low base in 2014. Mr Ong said revenue from chemicals will likely rise to about 10 per cent of total revenue by the end of the year. Likewise, the Government is not giving up on the marine sector. A Maritime and Port Authority of Singapore (MPA) spokesman said the longer term outlook remains positive as the long-term economic prospects for Asia are good. 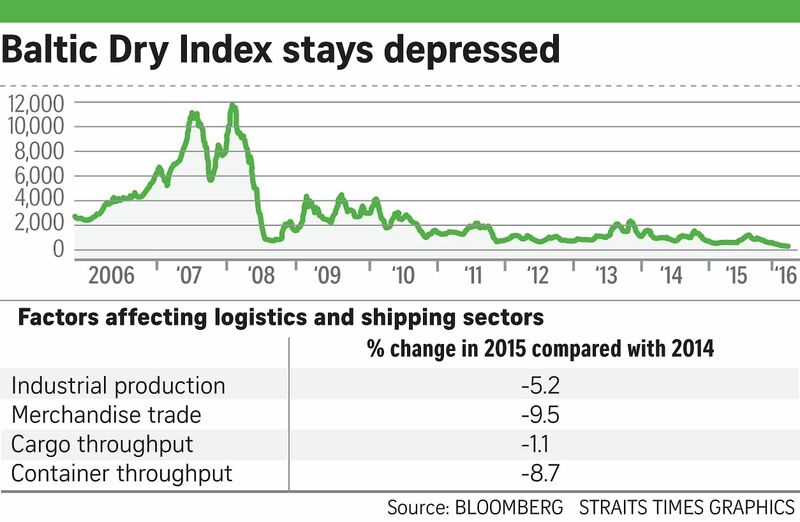 "We expect cargo volumes to increase again when the world economy recovers," she said. To back up its views, MPA is moving ahead to invest in new large terminals and improve port efficiency. For instance, work has started on the Next-Generation Port at Tuas. The Tuas Terminal will have capacity to handle 65 million standard-sized shipping containers, making it the largest container terminal in the world at a single location, the spokesman said. "The maritime industry will continue to be a key part of Singapore's economy and the Singapore Government remains strongly committed to its growth".